Cannoli are known as Italian-American pastries, although the origin of cannoli dates back to Sicily, specifically Palermo, where it was prepared during Carnevale season, and according to lore, as a symbol of fertility. The cannoli is a fried, tube-shaped pastry shell (usually containing wine) filled with a creamy amalgamation of sweetened ricotta cheese, chocolate, candied fruit or zest, and sometimes nuts. Although not traditional, mascarpone cheese is also widely used, and in fact, makes for an even creamier filling when substituted for part of the ricotta, or by itself. However, cannoli can also be filled with pastry creams, mousses, whipped cream, ice cream etc. You could also add your choice of herbs, zests or spices to the dough, if desired. Marsala is the traditional wine used in cannoli dough, but any red or white wine will work fine, as it’s not only added for flavor or color, but to relax the gluten in the dough since it can be a stiff dough to work with. Cannoli forms/tubes - optional, but recommended if making traditional shaped cannoli. Food Processor or Stand Mixer (Optional) Since you can make the dough by hand, although it takes more time. I used a Stand up Mixer. Variations: The filling is YOUR choice! Anything you want to fill them with is perfectly fine, sweet or savory, or you can use the filling recipe provided – making whatever changes you want to it. Cannoli would make a great addition to a Thanksgiving dessert table/spread. In many Italian households, during the holidays, cannoli is always part of the dessert offerings. You could also make a Thanksgiving themed cannoli, like pumpkin cannoli (I came up with a great pumpkin filling recipe below) or apples, pecans, walnuts, any dried fruits etc. An idea to gussy up your cannoli is; dipping the rims of the shell in melted chocolate and rolling in chopped nuts or sprinkles, then letting them set prior to filling. Dipping or pressing mini chocolate chips into the filled ends OR just stirring mini chocolate chips into the filling prior to stacking or filling whatever shaped shells you come up with, is another great idea and makes a nice presentation The sky is the limit here, be creative! Naturally, if you have any dietary restrictions, by all means, go with it. I’ve provided a link to a gluten-free cannoli recipe and a slightly savory vegan cannoli recipe to help get you started. Note on Wine : For those who don't like to cook or bake with alcohol - grape juice, cranberry juice, pomegranate juice, apple juice; any sweet juice of a fruit, especially ones used in or to make wine can be substituted. Just add a little more vinegar to ensure you get enough acid to relax the dough. I used Pomegranate Blueberry juice, since that’s what I had on hand. I had to use 3 more teaspoons of the vinegar to relax the dough. The shells were so tasty, it was hard to not eat them all before filling them. The juice added additional sweetness and tasted good even with the savory filling. This was the recipe provided for the challenge. The recipes for the fillings I used are given below. 1. In the bowl of an electric stand mixer or food processor, combine the flour, sugar, cocoa, cinnamon, and salt. Stir in the oil, vinegar, and enough of the wine to make a soft dough. Turn the dough out onto a lightly floured surface and knead until smooth and well blended, about two minutes. Shape the dough into a ball. Cover with plastic wrap and let rest in the fridge from 2 hours to overnight. 2. Cut the dough into two pieces. Keep the remaining dough covered while you work. Lightly flour a large cutting or pastry board and roll the dough until super thin, about 1/16 to 1/8” thick (An area of about 13 inches by 18 inches should give you that). Cut out 3 to 5-inch circles (3-inch – small/medium; 4-inch – medium/large; 5-inch;- large). Roll the cut out circle into an oval, rolling it larger and thinner if it’s shrunk a little. I used the lid of a cookie cutter tin, which measured about 4.5 inches. 3. Oil the outside of the cannoli tubes (You only have to do this once, as the oil from the deep fryer will keep them well oiled). Roll a dough oval from the long side (If square, position like a diamond, and place tube/form on the corner closest to you, then roll) around each tube/form and dab a little egg white on the dough where the edges overlap. (Avoid getting egg white on the tube, or the pastry will stick to it.) Press well to seal. Set aside to let the egg white seal dry a little. 4. In a deep heavy saucepan, pour enough oil to reach a depth of 3 inches, or if using an electric deep-fryer, follow the manufacturer's directions. Heat the oil to 375°F (190 °C) on a deep fry thermometer, or until a small piece of the dough or bread cube placed in the oil sizzles and browns in 1 minute. Have ready a tray or sheet pan lined with paper towels or paper bags. 1. Heat 2-inches of oil in a saucepan or deep sauté pan, to 350-375°F (176 - 190 °C). Combine the first four ingredients in a medium bowl. Spoon mixture into a piping bag fitted with a large star tip. Melt the chocolate in a microwave safe bowl for 2 minutes, stirring every 30 seconds, until smooth and creamy. Dip the ends of the cannoli shells in the melted chocolate and roll in the chopped pistachios. Let set before filling. For the savory filling, I used two jalapenos for color and heat. The garlic made it almost irresistible to pass. Heat oil in a non stick pan. Add the minced garlic and chopped jalapenos. Saute for a minute and then add the chopped onions. Cook onions and then stir in the yellow corn and salt to taste. Cook for a couple of minutes and then turn off heat. Let mixture cool completely. Combine with the drained ricotta and fill cannoli shells. I dusted the sweet cannolis with a light sprinkle of confectioner’s sugar and served the savory cannolis with a squirt of hot sauce on the plate. These are some tips provided by Lisa and they are definitely worth noting. - Rolling the dough to paper thinness, using either a rolling pin or pasta machine, is very important. If the dough is not rolled thin enough, it will not blister, and good cannoli should have a blistered surface. - Initially, this dough is VERY stubborn, but keep rolling, it eventually gives in. Before cutting the shapes, let the dough rest a bit, covered, as it tends to spring back into a smaller shapes once cut. Then again, you can also roll circles larger after they’re cut, and/or into ovals, which gives you more space for filling. - Your basic set of round cutters usually doesn’t contain a 5-inch cutter. Try a plastic container top, bowl etc, or just roll each circle to 5 inches. There will always be something in your kitchen that’s round and 5-inches if you want large cannoli. - Oil should be at least 3 inches deep and hot – 360°F-375°F, or you’ll end up with greasy shells. I prefer 350°F - 360°F because I felt the shells darkened too quickly at 375°F. - If using the cannoli forms, when you drop the dough on the form into the oil, they tend to sink to the bottom, resulting in one side darkening more. Use a slotted spoon or skimmer to gently lift and roll them while frying. - DO NOT crowd the pan. Cannoli should be fried 2-4 at a time, depending on the width of your saucepan or deep fryer. Turn them once, and lift them out gently with a slotted spoon/wire skimmer and tongs. 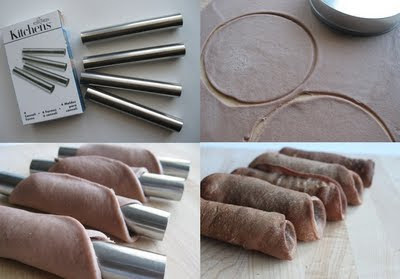 Just use a wire strainer or slotted spoon for flat cannoli shapes. - When the cannoli turns light brown - uniform in color, watch it closely or remove it. If it’s already a deep brown when you remove it, you might end up with a really dark or slightly burnt shell. - Depending on how much scrap you have left after cutting out all of your cannoli shapes, you can fry them up and sprinkle with confectioner’s sugar for a crispy treat, or let the scraps rest under plastic wrap and a towel, then re-roll and cut more cannoli shapes. - Push forms out of cannoli very gently, being careful not to break the shells as they are very delicate. DO NOT let the cannoli cool on the form, or you may never get it off without it breaking. Try to take it off while still hot. Hold it with a cloth in the center, and push the form out with a butter knife or the back of a spoon. - When adding the confectioner’s sugar to the filling..taste. You may like it sweeter than what the recipe calls for, or less sweet, so add in increments. - Fill cannoli right before serving! If you fill them an hour or so prior, you’ll end up with soggy cannoli shells. - If you want to prepare the shells ahead of time, store them in an airtight container, then re-crisp in a 350°F (176 °C) oven for a few minutes, before filling. Hubby and I polished off the savory ones in no time and the sweet ones I gave to friends who enjoyed them just as much. Thanks Lisa for a wonderful challenge! Looks yummy and what an informative post you've written! Thanks! these looks so delicious ..it shows all the effort there ..I have heard some even use meat as filling also ..
You did two version one sweet and one savoury and they both sound delicious and your photos of them and the process are so beautiful and so elegant. Bravo on your results. Cheers from Audax in Australia. amazing pictures and delicious looking cannoli. I adore the sweet but would love to try the savory one. Wonderful looking canoli andvery delicious and a good click with beautiful pictures. Both your sweet and savory cannoli look and sound incredible, and your photos are gorgeous! Thanks so much for deep frying with me this month! Wow next time I'm going to try the savory ones too, looks yummy! Great idea with the savoury ones. And what pretty sweet cannoli. Great work and great pics. Each ingredient in the sweet filling is so good that all I am doing is CRAVE. Great job on your cannoli!